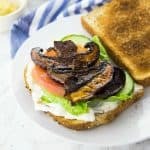 If you used to love bacon and are looking for a vegan alternative, you will LOVE this vegan bacon with mushrooms. It’s ready in just 15 minutes and it’s so much healthier than real bacon. The savory flavor will make you go back for seconds and thirds! I’ve heard that vegan bacon is also called “facon” or “vacon”. But no matter how you want to call it, vegan bacon really is a thing – and it’s pretty damn delicious! Over the last years, I’ve tried several vegan bacon recipes. 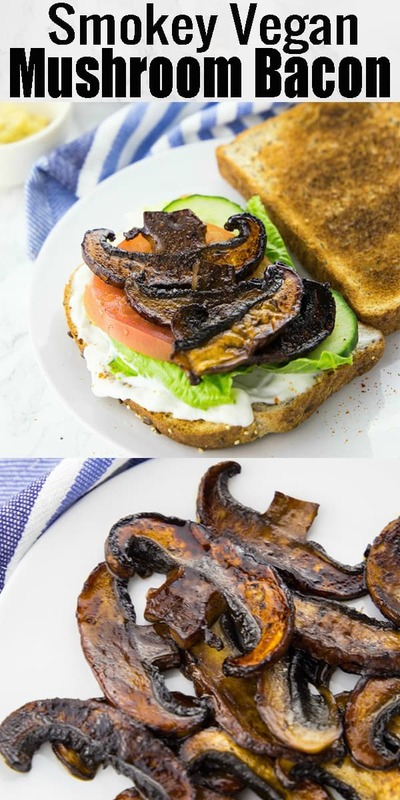 This vegan mushroom bacon soon became my favorite and we’ve made it so many times! The liquid smoke and the smoked paprika powder give it an incredibly smoky taste. 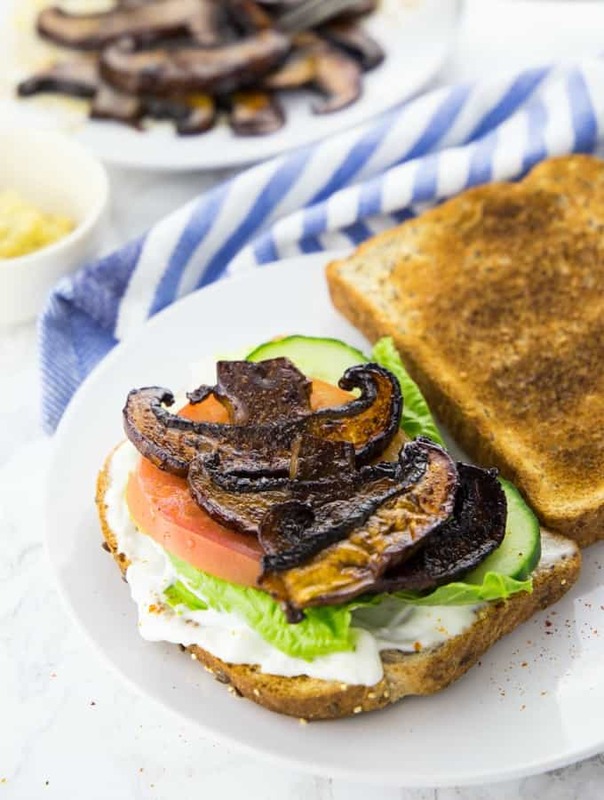 Portobello mushrooms are thick, meaty, and rich in flavor, which makes them perfect for this vegan bacon. They’re such a great meat substitute! And perfect for those of you with a soy or gluten intolerance. Soy sauce and vegan Worcestershire sauce give it a hearty and salty taste that resembles traditional bacon. And the maple syrup really hits the spot. I mean smoky maple “bacon”, right? Plus, the recipe couldn’t be much easier and is ready in under 15 minutes. The ingredient list for this mushroom bacon is pretty short. A lot of the ingredients might be staples in your kitchen anyway. As always, you can find the full ingredient list in a separate, printable recipe box at the end of this post. The preparation of this vegan bacon couldn’t be much easier. All you have to do is follow five easy steps! FIRST STEP: Clean the mushrooms and slice them with a sharp knife. SECOND STEP: In a small bowl combine the ingredients for the marinade (smoked paprika powder, soy sauce, liquid smoke, vegan Worcestershire sauce, and maple syrup). Season with salt and pepper. Whisk until well combined. 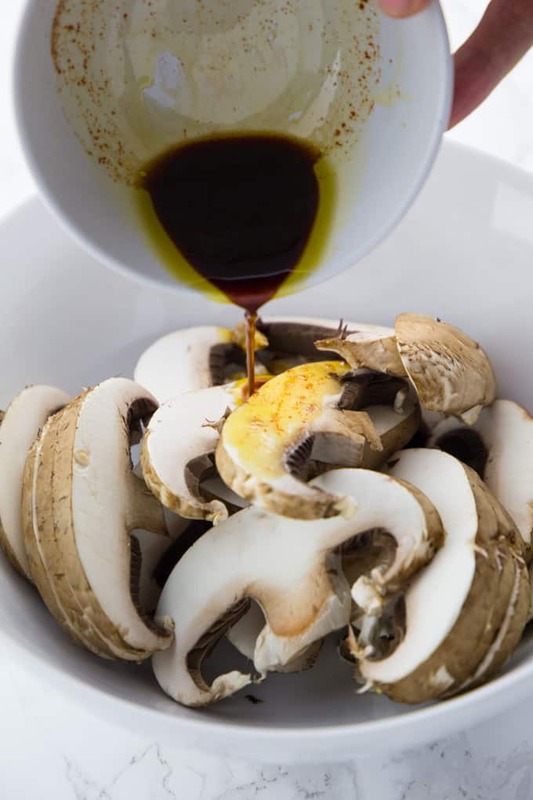 THIRD STEP: Put the sliced mushrooms in a bowl and pour the marinade over the mushrooms. FOURTH STEP: Carefully stir the mushrooms with a wooden spoon until they’re completely marinated. FIFTH STEP: Heat some olive oil in a large nonstick pan on high heat (the mushrooms will shrink considerably during the cooking process). Add the mushrooms and drizzle another 1/2 teaspoon of soy sauce and 1/2 teaspoon of maple syrup on top. Cook for 3-4 minutes on each side on high heat. Liquid smoke is a key ingredient in this recipe. Don’t leave it out as the mushroom bacon won’t become smoky and resemble real bacon. You can find liquid smoke in the condiments aisle of most well-stored supermarkets. If you have a hard time finding it, you could also order it online. A bottle of liquid smoke will keep forever as you only need very little of it! Make sure not to use more liquid smoke than mentioned in the recipe as it has a very strong taste (and smell). If you’re suffering from a gluten intolerance, you can substitute the soy sauce with tamari. The mushrooms will shrink considerably during the cooking process, so please consider this when cooking for a larger crowd. You could also use cremini mushrooms instead of portobello mushrooms, which results in smaller pieces of “bacon”. The texture also won’t be as meaty. This mushroom bacon is pretty versatile. There are so many ways you can serve it. Are you looking for vegan bacon bits you could sprinkle on top of a salad, baked potatoes, or a soup? Then just turn this vegan mushroom bacon into bacon bits! Instead of cutting the mushrooms into slices, just cut them into small cubes. Then just follow the rest of the recipe. However, if you’re doing this, you might want to adjust the cooking time a bit. The best rule is to cook them until they’re crispy. As I’ve already said, I usually use tempeh bacon for my vegan carbonara. It makes a a really great bacon substitute and is very easy to make. I especially like its firm texture and that it’s really crispy. 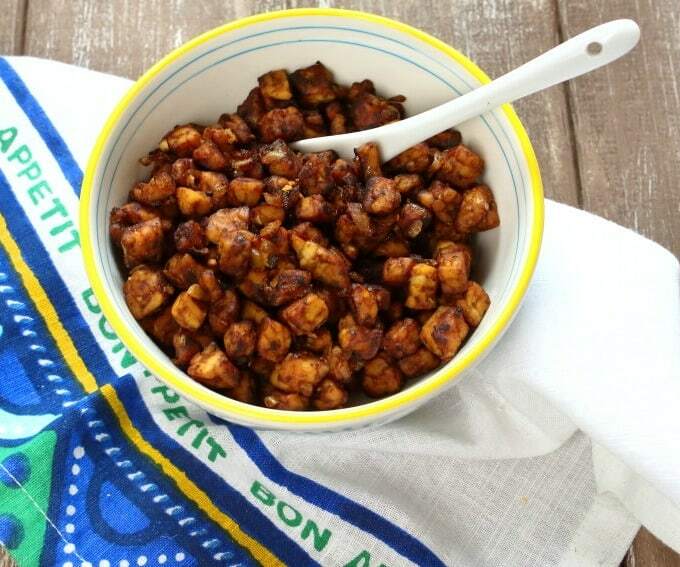 For my tempeh bacon recipe I cut the tempeh in cubes and marinated them with BBQ sauce and other spices. The recipe is actually pretty similar to this one. The marinade is, however, different. It’s great for sprinkling over pasta and salads! This might sound a bit weird at first, but using rice paper is such a great way to make vegan bacon. 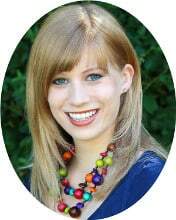 It’s a huge trend on Pinterest and around the web right now! And it really does look like real bacon, doesn’t it? It got a really great texture that resembles crispy bacon. 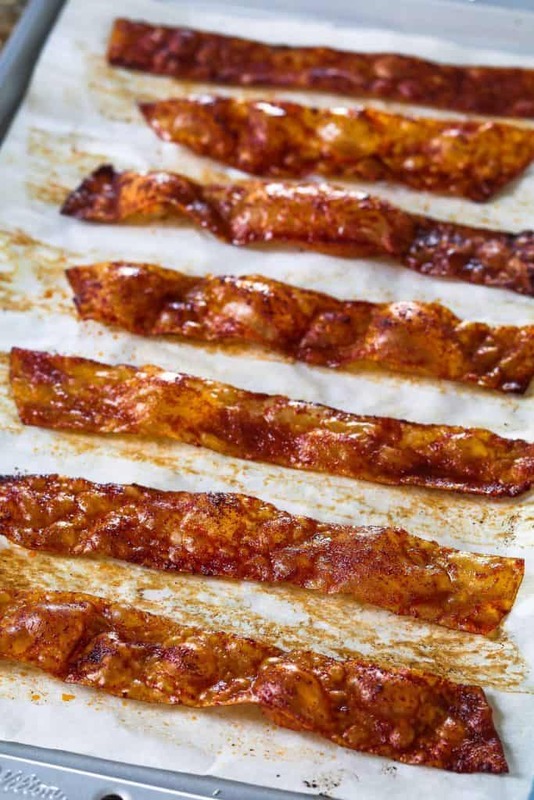 If that sounds like something you’d like to try, check out this rice paper bacon. Melissa from Vegan Huggs did an amazing job in creating this crispy and smoky vegan alternative to bacon. You can even use coconut flakes to make vegan bacon! Can you believe it?! Just pour a smoky marinade over the coconut flakes and pop them into the oven. They’ll come out crispy and smokey! 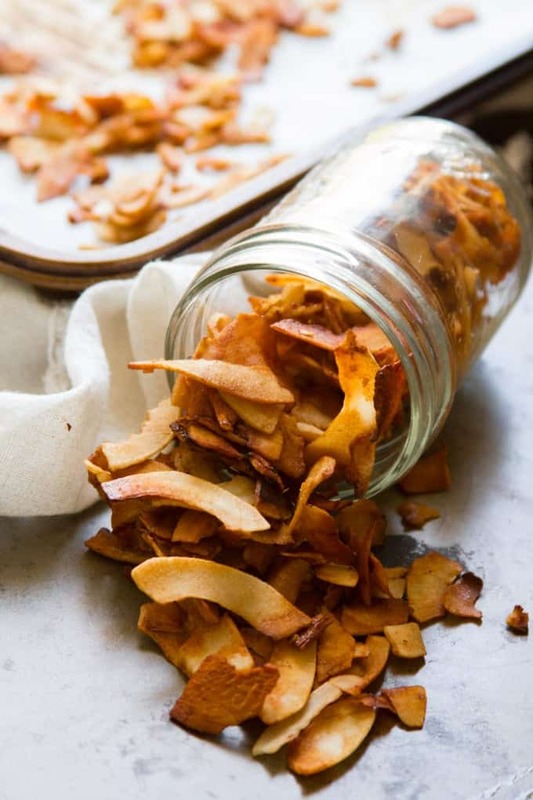 Alissa from Connoisseurus Veg got a great recipe for coconut bacon on her blog. I hope you like my vegan mushroom bacon as much as we do around here. And hopefully this little guide on vegan bacon was helpful as well. We crazy vegans can make bacon out of everything! Haha! If you give this mushroom bacon a try, I’d love to know what you think about it. Just leave me a comment and a star rating below. Your comments really make my day! 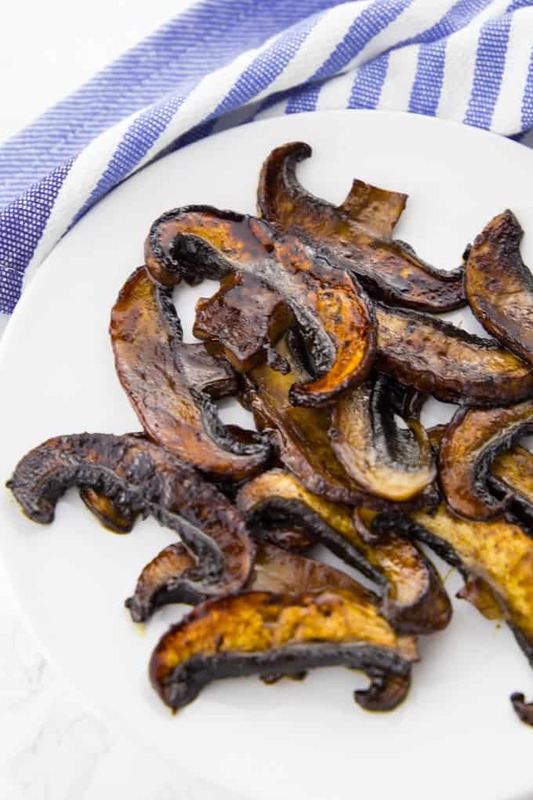 If you used to love bacon and are looking for a vegan alternative, you will LOVE this vegan bacon with mushrooms. It's ready in just 15 minutes and so much it's so much healthier than real bacon. The savory flavor will make you go back for seconds and thirds! 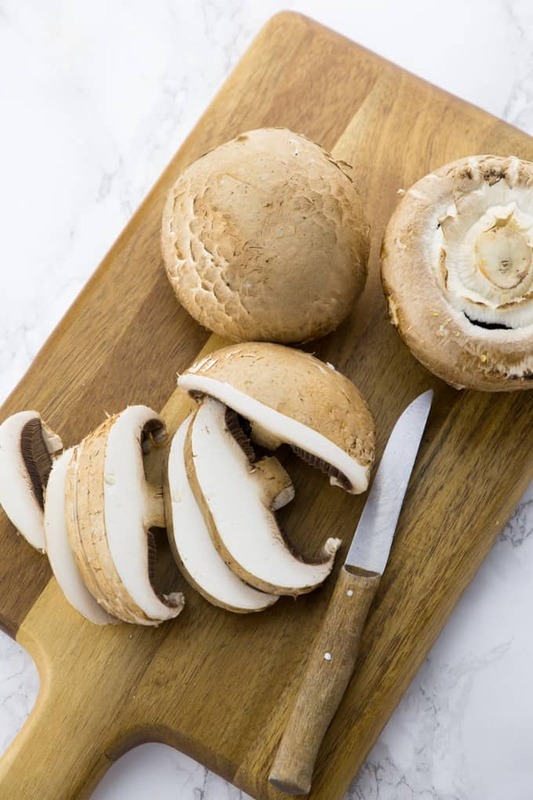 Clean the mushrooms and slice them with a sharp knife. 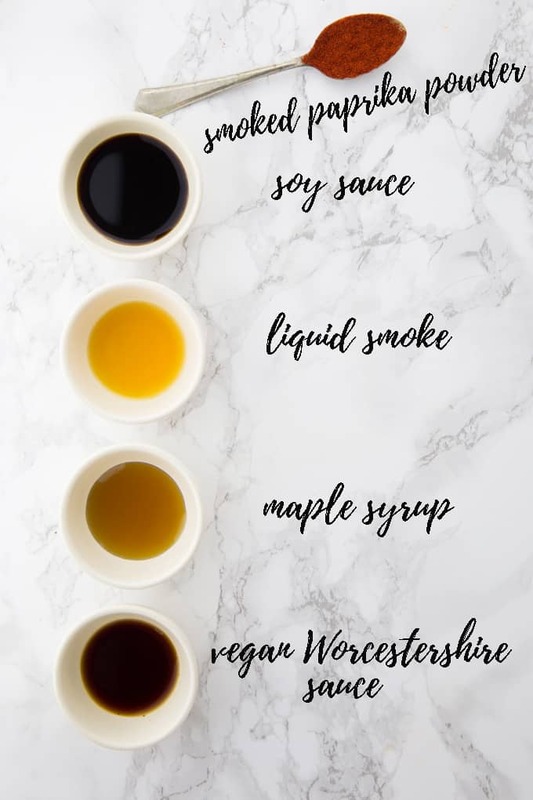 In a small bowl combine the ingredients for the marinade (smoked paprika powder, soy sauce, liquid smoke, vegan Worcestershire sauce, and maple syrup). Season with salt and pepper. Whisk until well combined. 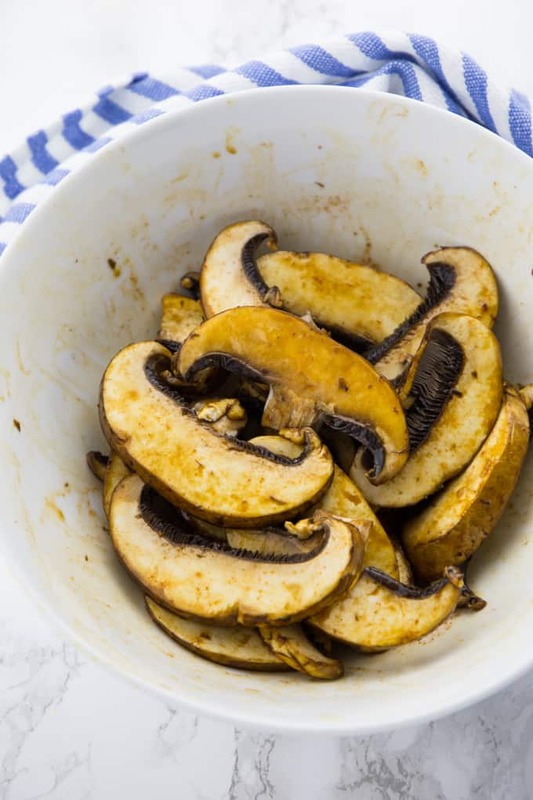 Put the sliced mushrooms in a bowl and pour the marinade over the mushrooms. 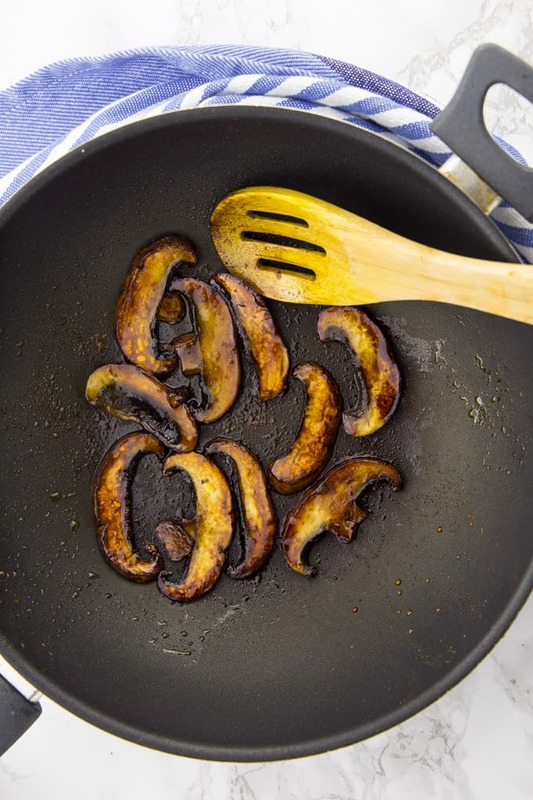 Carefully stir the mushrooms with a wooden spoon until they're completely marinated. Heat some olive oil in a large nonstick pan on high heat (the mushrooms will shrink considerably during the cooking process). Add the mushrooms and drizzle another 1/2 teaspoon of soy sauce and 1/2 teaspoon of maple syrup on top. Cook for 3-4 minutes on each side. 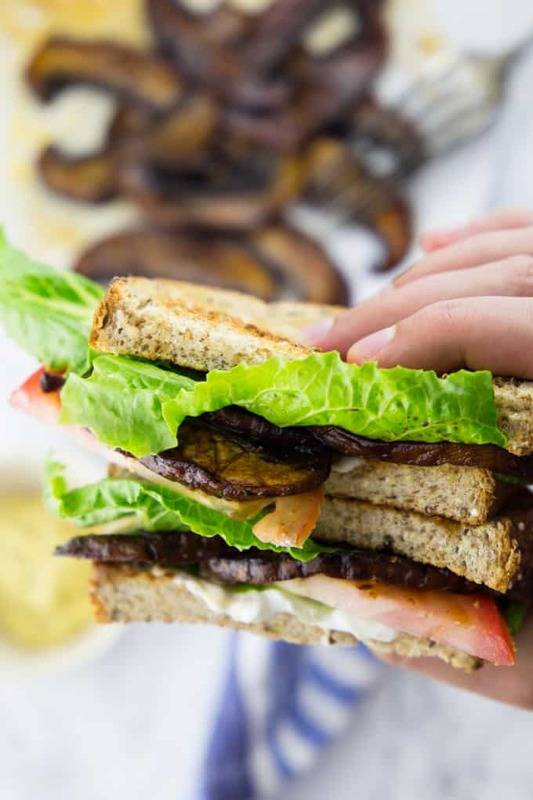 Serve on a sandwich with vegan mayonnaise, lettuce, and tomatoes (vegan BLT) or with scrambled tofu or hash browns. Enjoy! Liquid smoke is a key ingredient in this recipe. Don't leave it out as the mushroom bacon won't be smoky and resemble real bacon. You can find liquid smoke in the condiments aisle of most well-stored supermarkets. If you have a hard time finding it, you could also order it online. A bottle of liquid smoke will keep forever as you only need very little of it! If you're suffering from a gluten intolerance, you can substitute the soy sauce with tamari. You could also use cremini mushrooms instead of portobello mushrooms, which results in smaller pieces of "bacon". The texture also won't be as meaty. Wow! This looks incredible. I tried it today for breakfast and it was amazing. Thanks.